Mixing high-end/low-end style isn’t exactly a new concept in the fashion world, but Balenciaga has taken the aesthetic to new—and slightly ludicrous—heights: As CNN reports, the French luxury brand has designed a blue tote bag that’s drawing comparisons to IKEA’s famously inexpensive and durable 99-cent shopping bag. Their version costs $2145. It’s unclear whether or not Balenciaga actually drew sartorial inspiration from the popular Swedish furniture retailer, but the resemblance between their "Arena" tote and IKEA’s utilitarian "Frakta" carryall is unmistakable: Both bags are oversized, crinkly, and bright blue, with both short and long handles and plenty of storage space. The difference is in the details: IKEA’s bag is made from a synthetic material, polypropylene, and its handles are emblazoned with the retailer’s logo. Balenciaga's tote is crafted from "glazed leather," and bears a gold-stamped logo (and costs 2145 times as much as its reusable counterpart). 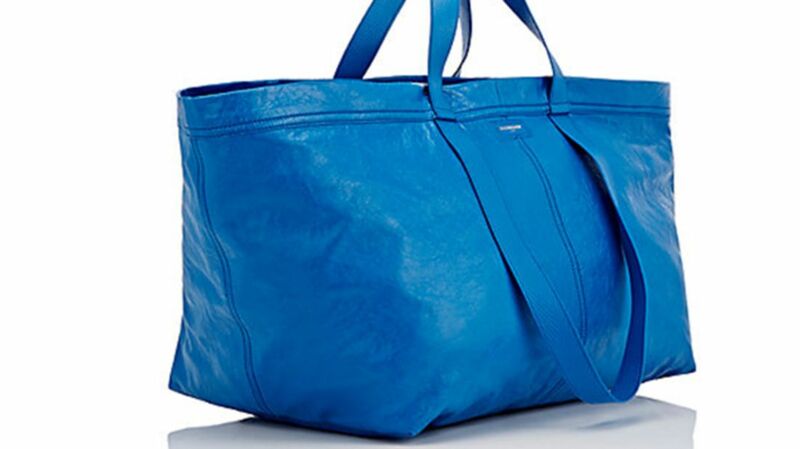 Balenciaga is selling its blue bag at high-end department store Barneys. But whether the concept of a luxury, IKEA-inspired bag makes you feel amused, angry, or simply poor, the situation is proof that customers from all income brackets can appreciate a roomy, ultra-practical tote.